All arrangements are created by a preferred local florist that delivers to your selected location, whether that is the service location, Lemley Funeral Service or the family home. For morning services, orders must be placed by 12pm in the recipient's time zone the previous business day. Orders are processed Monday through Saturday by local florists using local delivery methods. No deliveries will be made on Sundays. To ensure same-day delivery, the order must be placed before 11:00 a.m. EST Monday through Saturday (major holidays excluded). Orders for Monday morning delivery must be placed by 12 p.m. on Saturday. You can practically hear the waves crashing and almost feel a gentle breeze caressing your face. 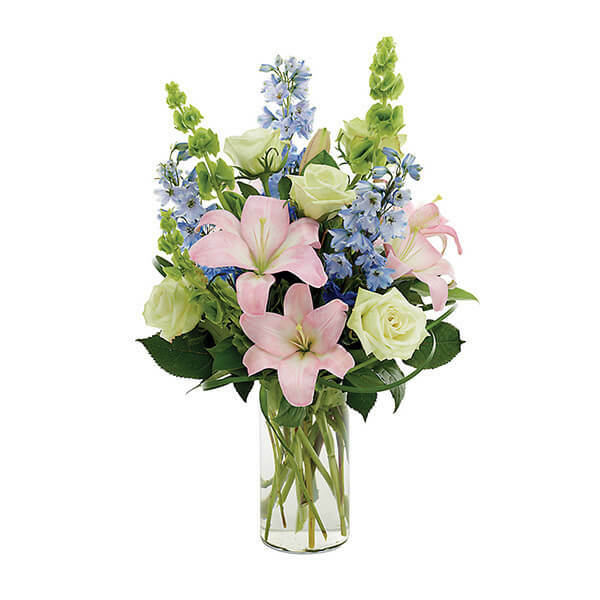 This bounty of natureâ€s beauty boasts green roses, blue delphinium, pink Asiatic lilies, Bell of Ireland and lily grass in an elegant clear vase.